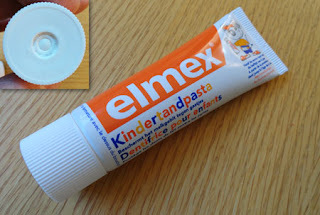 Elmex Kinderandpasta is a kids' toothpaste from Belgium (Brussels, to be exact), produced by Gaba International. It's white and has a distinct minty flavor with a tiny hint of bubblegum. The fact that as an adult, I enjoy the flavor, is a good indication that it's not too overly strong or artificial. Using Google Translate, here's what it offers: "the daily careofmilkteethand for the protectionof the enamelbrittle,not quitehardenedagainst cavities." The packaging is in Dutch and French, making it perfect for all of Belgium (well, maybe not for those Belgians who speak Arabic as their mother tongue). Americans, you can even buy it on Amazon! I was lucky enough to get it for my birthday - from my sister, who lives in Belgium.